In a letter last month to New York legislative leaders and Gov. Andrew Cuomo, the coalition, Communities United For Police Reform, called Section 50-a "the nation's most regressive, secretive and least transparent law that local municipalities across the state have used to shield abusive officers and abusive departments from public view." That's not hyperbole. Prior to this year only two other states explicitly made police misconduct records confidential. (California recently enacted a bill opening such records to the public.) A 2018 report by the New York City Bar concludedthat 50-a "has been interpreted so broadly that police misconduct in New York State is more secretive than any other state in the nation." One New York Assembly member, Democrat Daniel O'Donnell, has introduced a bill that would fully repeal the infamous statute. He's introduced it repeatedly over the years, but now, with Republicans and the centrist Democrats who caucused with them out of power, activists see the best chance in years to finally do away with 50-a. Section 50-a began more modestly. When the New York legislature passed it in the 1976, Civil Rights Law 50-aauthorized police departments, prisons, and fire departments to withhold "all personnel records used to evaluate performance toward continued employment or promotion." It was intended to stop criminal defense attorneys from using frivolous citizen complaints to discredit officers' testimonies at trial. Since then, however, it's been expanded to hide, or attempt to hide, things like substantiated citizen complaints of excessive force, shooting reports, body camera footage, reports of lost police guns, transcripts and outcomes of administrative trials, and even anonymized data on police use-of-force. "What we've seen in practice is that a 'personnel record' becomes whatever a police department doesn't want the public to see," Michael Sisitzky, lead policy counsel at the New York Civil Liberties Union (NYCLU), says in an interview. Part of the coalition to repeal Section 50-a also includes family members of people slain by police, like Malcolm and the family of Eric Garner, who died in 2014 after NYPD officer Daniel Pantaleo placed him in a chokehold. Pantaleo had an extensive disciplinary history prior to his fateful meeting with Garner, but the public would have never learned of that if his records weren't leaked to Think Progress. The Legal Aid Society sued New York City's Civilian Complaint Review Board (CCRB) to try and obtain summary information about sustained complaints against Pantaleo and disciplinary recommendations. A Manhattan judge orderedthe CCRB in 2015 to release the information, ruling that it could not be withheld under Section 50-a. However, lawyers for New York City appealed the decision. A CCRB employee then leaked Pantaleo's files, revealing that he "had seven disciplinary complaints and 14 individual allegations lodged against him. Four of those allegations were substantiated by an independent review board," according to Think Progress. Pantaleo's total punishment was two days of docked pay. In 2017, after the leak of Pantaleo's records, a New York appellate court unanimously reversed the lower court ruling, ruling that even summaries of misconduct findings against police officers were confidential under Section 50-a. Similarly, BuzzFeed News obtained thousands of NYPD misconduct records through a leak. The resulting investigation, published last year, identified 319 NYPD employees who had committed offenses serious enough to warrant firing—lying, stealing, ticket-fixing, excessive force—yet were allowed to keep their job. That information would have never seen the light of day under current New York law, if it hadn't been leaked. Robert Freeman has been the executive director of the New York Committee on Open Government since 1974. He's had the same office phone number for 45 years—a record among state employees, he suspects—and in his decades on the job, he's watched Section 50-a grow like a parasitic vine. "There've been numerous situations in which records that most people probably would not characterize as personnel records have been so characterized by the courts," Freeman says. "So the consequence, in my opinion, is that the scope of 50-a and the ability to deny access has expanded over the course of years." For example, in 2016, the NYPD abruptly stopped posting the outcomes of administrative trials for officers accused of misconduct. For years, the NYPD had posted lists of cases that were closed out by plea deals or internal trials, along with transfers, promotions, and retirements, on a clipboard inside its public information office. First, the department told reporters that it was trying to save paper, but then NYPD said that someone in the legal department decided that the contents of the clipboard were personnel records, and thus barred from release under state law. The NYCLU sued to obtain the records, but in December, the New York Court of Appeals ruled in favor of the NYPD, finding that under Section 50-a even redacted information of its department trials and disciplinary recommendations were confidential. The ruling means that not only may police departments withhold such information, but they now appear barred from voluntarily releasing any information that falls under the 50-a umbrella, including the trial calendar of upcoming disciplinary cases, meaning the only way for watchdog groups to get information is to send court monitors to the NYPD headquarters at 1 Police Plaza every day. The intense scrutiny and public outrage over the Garner killing, coupled with the damning details uncovered by BuzzFeed, has led New York City Mayor Bill de Blasio and NYPD brass to soften their once absolutist stance on Section 50-a. The NYPD launched the aforementioned independent review in response. De Blasio now calls the law "flawed" and supports legislative reform. Until recently, however, the mayor's office and the NYPD have fought an unyielding and often successful legal battle against civil liberties groups and news outlets to expand the very law they now say they are lamentably bound to follow. Police unions have also fought to expand the vast apparatus of secrecy they enjoy. For instance, the Patrolmen's Benevolent Association (PBA), an NYPD union, is suing the city to try and block the release of police body camera footage, arguing that the video amounts to "personnel records" under Section 50-a—a position not supported by the police department itself. "This footage has serious implications not only for the safety and due process rights of police officers, but for the privacy and rights of members of the public, as well," union chief Patrick Lynch said in a statement. "The mayor and the NYPD have shown a reckless disregard for these concerns by circumventing the existing process set up by the State Legislature and selectively releasing portions of videos to suit their own interests." Unsurprisingly, the PBA opposes repealing Section 50-a. It did not respond to requests for comment for this article, but Lynch told the New York Daily News last month that "amending or repealing the law will have devastating effects on public safety and on the safety of all law enforcement officers throughout New York State." With city officials passing the buck to the state legislature, and courts obliged to uphold decades of accumulated precedent, it's fallen on news organizations and advocacy groups to do the tough, often expensive work of challenging New York's secrecy regime. "We think section 50-a is a huge obstacle to accountability, and that's especially unfortunate at a time when people are demanding more accountability from the police departments around the state," says David McCraw, deputy general counsel for The New York Times. "It's always struck me as odd that, if the mayor is accused of misconduct, or a sanitation worker is accused of misconduct, there's access to those documents, but not the police." In 2016, a Rikers Island prison guard who was caught on tape beating a 16-year-old inmate sued New York City to block public access to disciplinary hearings. For more than three decades, disciplinary hearings for prison guards and their outcomes were open and public through New York City's Office of Administrative Trials and Hearings (OATH). The suit, backed by a correctional officer union, sought to not only block future public access to those hearings, but also seal all previous records. Notably, McCraw says New York City declined to take a position on the lawsuit against it. The New York Times and the NYCLU had to seek permission from the court to intervene in the lawsuit, lest the effort to scrub 35 years of disciplinary proceedings from the public record go unopposed. "We've learned a great deal about the problems at Rikers, and a great deal about the efforts to resolve the problems, through those OATH proceedings," McCraw says. "They shouldn't be closed." Last May, a New York state judge ruled that OATH was an independent agency and therefore not bound by Section 50-a. The correctional officer has appealed the decision, and the case is still being fought at the appellate level. These sort battles play out regularly all over New York between law enforcement agencies and news outlets, big and small. As the Columbia Journalism Review reported in a 2014 story on Section 50-a, the law "has become an effective roadblock to news organizations seeking data on police misconduct and discipline," with organizations from the Times-Union to Newsday embroiled in legal battles over records kept hidden by the law. The NYPD rejected my request, citing several exemptions, including Section 50-a—despite the fact that two years prior to my request, a New York judge ruled in response to a NYCLU lawsuit that such discharge reports are public record and subject to disclosure. The NYPD is notorious for flouting the state's public record law. Police unions say that repealing 50-a would endanger officer safety, but Freeman says repeal wouldn't result in unfettered access to internal police files. Officers would still be covered under the same privacy protections as other state employees. What New York has created, and what police and correctional officer unions would dearly love to preserve, is a special class of public employees—above school board members, city councils, mayors, and judges—whose conduct is beyond any meaningful public scrutiny. "The result is that—and I think it's ironic—those public employees who have the most power and authority over people's lives are the least accountable among public employees," Freeman says. "To my mind, it's backwards, it doesn't make sense, and in the best of all worlds, I'd love to see a full repeal of 50-a." Richard Haste, the NYPD officer who shot Ramarley Graham, was indicted for manslaughter by a Bronx grand jury in 2012, but a judge threw out the case on technical grounds after a prosecutor gave faulty instructions to the jury. A second grand jury chose not to indict him again. Former U.S. Attorney Preet Bharara, now a popular podcast host, declined to bring federal civil rights charges against Haste. At Haste's internal department trial, the judge found Haste made "tactical errors" and recommended he be fired, but he was allowed to retire with full benefits before he could be terminated. 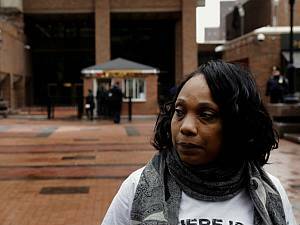 In 2015, Graham's family settled a wrongful death lawsuit against the city for $3.9 million, but Malcolm continued to fight the NYPD for more information on the death of her son. She filed a public records lawsuit in 2017 seeking, among other things, transcripts of Haste's department trial and audio interviews with cops and witnesses of the shooting. Lawyers for New York City argued the records were not only exempt under 50-a, but that releasing them raised a "substantial, realistic possibility of harassment and violence" against Haste and two other officers involved in the shooting. In August of last year a judge ordered the NYPD to release most of the documents, finding the department had caused an "unreasonable delay" in handing over the records to Graham's family that they were entitled to under New York law. In the meantime, the public perception of the shooting of Ramarley Graham was dominated by the NYPD's account, while Graham's family worked mostly in vain, stymied by Section 50-a, to figure out what really happened. "A lot of times when you, when you hear a story about a black or brown young man or woman, you don't hear the full story," Malcolm says. "You hear the bad part of it, right? Even after six years I got people saying, 'Oh, the kid that was running.'"